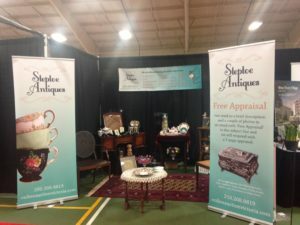 Thanks to all of our friends that came to visit us at the 55+ Lifestyle Show held at the Pearkes Arena March 21. The show put on by Inspired Senior Living Magazine was full of interesting displays and activities geared to the 55 plus crowd; I fit in perfectly. We must have given away 250 coupons for a free antique appraisal, 80 business cards and 1000 chocolate Easter eggs. We met many very nice people who may or may not want to part with their antiques, collectibles and fine bone china. We set up a display of antiques and decorative items that we thought would catch people’s attention. The items that garnered the most attention were our display of vintage costume jewelry and some embroidered WWI postcards from soldiers overseas sent home to their families. 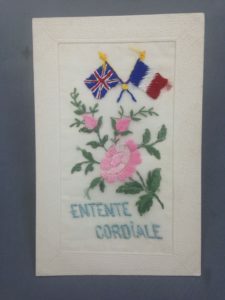 The embroidered postcards were very popular with British soldiers who often sent them home. They were sold in thin paper envelopes but were seldom sent through the post in them. They were too fragile and, more particularly, they represented quite an investment – they were not cheap souvenirs. Usually they were mailed with letters. For this reason, they are often unwritten, with no marks on the back, any message having been sent in an accompanying letter. There are a fantastic number of designs to these cards, generally patriotic or sentimental, all seeking to show the bright colours of the threads to best effect. Flags, butterfly wings, bird plumage and rainbows feature strongly. Also embroidered – usually in a single colour – are a few words. A ‘silk pocket’ effect can also feature, into which a tiny pre-printed card can be found. Some of the most collected cards today are those featuring cap badges of individual regiments – intricate designs often requiring great skill to reproduce in thread. Can’t wait to do this fun and entertaining trade show again next year.